The second expansion for Roll for the Galaxy, the dice game adaptation of Race for the Galaxy, is on its way. As is good manners for expansions these days Rivalry will have three expansion modules. The first simply adds more of the things you know, more dice, more factions, more home worlds, more everything. The other two make bigger changes. In the Deal Game you can trade virtually anything for anything else. I’m not talking about one home world for another, I’m talking about trading one of your dice for a longer credit track because you have too much money. Pretty much anything goes. The Orb Game gives every player a new dice, one of those with exchangeable faces. You can upgrade this dice along different upgrade lines to match your strategy. Those are some fancy upgrades. Tile laying games are a simple genre in theory, but they still come up with neat, new twists. In Gardens of Babylon that twist is called the Cascade. Let’s start at the beginning, though. In Gardens of Babylon you build the famous Hanging Gardens, one of the seven wonders of the ancient world. That’s the tile placement. 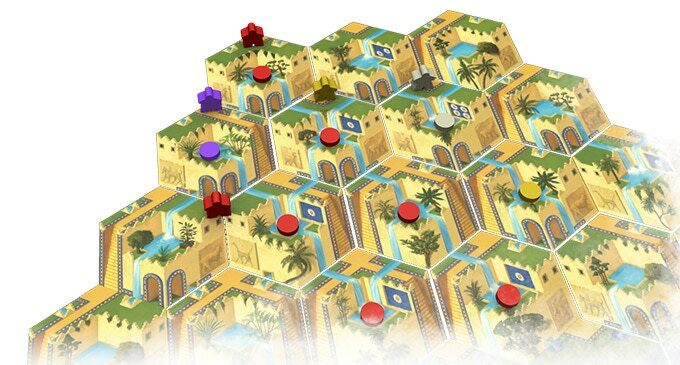 The tiles are connected by stairs and passages for your gardener meeples to move. When your gardener ends up on a tile where no one planted a seed yet he may do just that. Seeds are good because they are what gives you points. And this is where the Cascade comes in. Besides archways and stairs you have water cascades connecting the tiles. If you plant a seed at the top of a cascade then more seeds can wash downwards and replace opponents’ seeds downstream from yours. 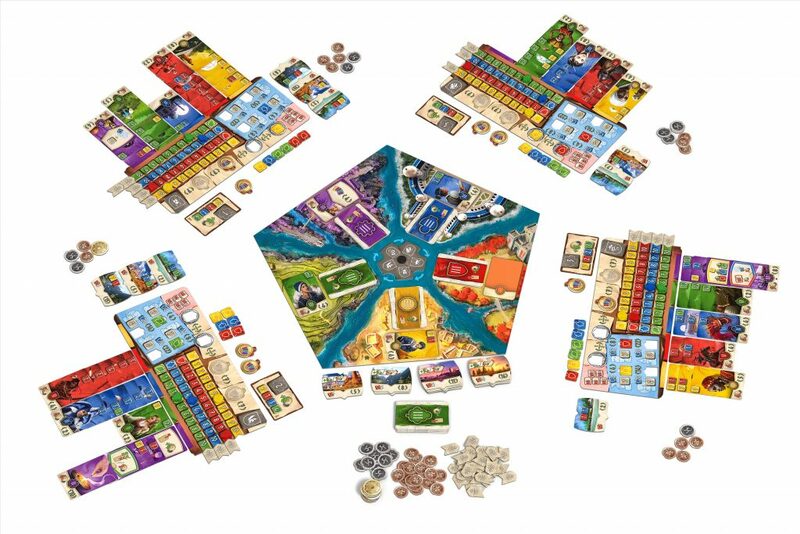 Gardens of Babylon becomes a contest of getting your gardeners upstream from opponents’ seeds while protecting your own. The rules are straightforward, but making useful connections of paths and cascades will require planning. Portal Games had their Portalcon convention this last weekend and announced a long list of new games to look forward to. To start with, there will be Imperial Settlers: Empires of the North. This will not be an expansion but a stand-alone sequel with three new factions: Scots, Vikings and Inuit. Only three factions, but each will have two different decks in the box. We don’t know yet if you’ll be able to mix Empires of the North with your original Imperial Settlers. The second new Imperial Settlers game follows the current revival of Roll & Write games. 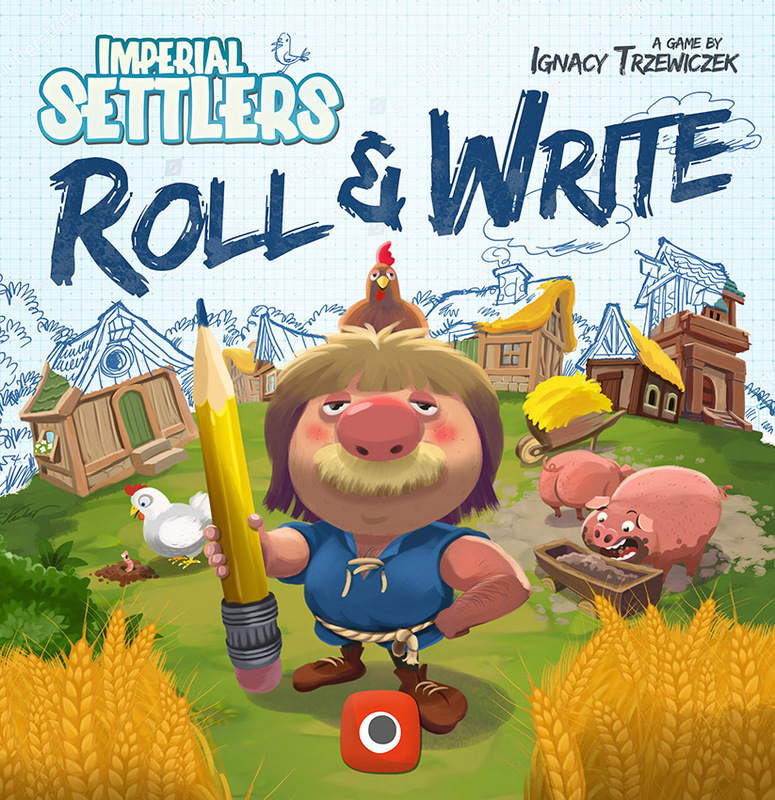 That’s also the name of the game: Imperial Settlers Roll & Write. The description does sound like it will be more complex than the average R&W game, with a focus on engine building and more choices with each passing round. Also special in this game, and a really neat idea, is the single player adventure. In a special score pad with 48 unique game sheets you can prove your empire building acumen for high scores. And one more for Imperial Settlers, the Big Box will give you original Imperial Settlers with all its expansions plus a new deck of anniversary cards. Then there will be a new edition of Pret-a-Porter, the first Portal game we ever reviewed. The third edition of the very competitive game about the fashion industry will come to Kickstarter later this year. Monolith Arena, the fantasy twin brother of Neuroshima Hex, will have its first army pack this year. The Academics have few units on the field, but they are strong and supported by a good selection of upgrades. Neuroshima Hex and its post-apocalyptic world aren’t done yet, either. The Sand Runners will the next faction to join the game, with the versatility of a double-sided HQ and … sand storms? Yup, it says sand storms. One more older Portal game will make a comeback this year. Stronghold: Undead will be released again, with the new second edition Stronghold rules. Finally, there is a number of new things for Detective, last year’s awesome police procedural boardgame. One big new project will be L.A. 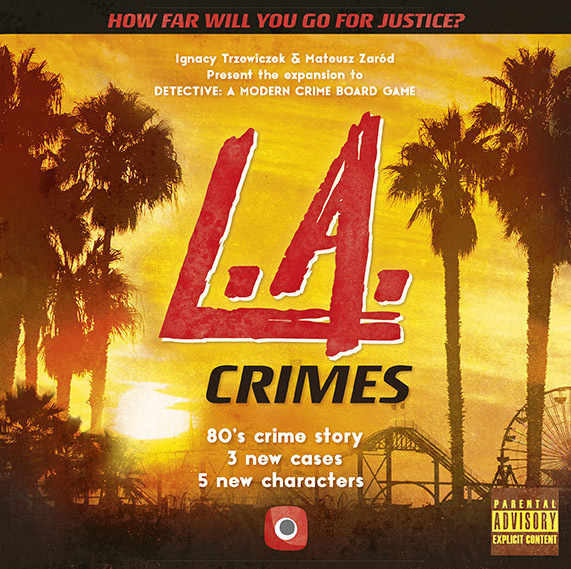 Crimes, an expansion with three new cases in 1980s Los Angeles. Just as big, and more ambitious, is the release of Detective: Alexa Edition. Playing Detective with Amazon’s voice assistant will supposedly feel like a radio drama, and Portal hopes to attract new people to the hobby as a whole. This is not going to be the reason why I finally cave and buy an Alexa, but I can’t deny my curiosity. Finally, the Detective Signature Series will have stand-alone cases for Detective by the industry’s greatest storytellers. The first two cases are by Mr. Legacy Rob Daviau and Mike Selinger, designer of the Pathfinder Adventure Card Game, Lords of Vegas, and more. This is going to be fun. In a Facebook video Matt Leacock talks about Era: Medieval Age, his new game to be released by Eggertspiele. Matt calls it a “spiritual successor to Roll through the Ages“, which is sure to make many fans happy. Where Roll through the Ages was a roll-and-write game Era: Medieval Age is going to be a roll-and-build game. 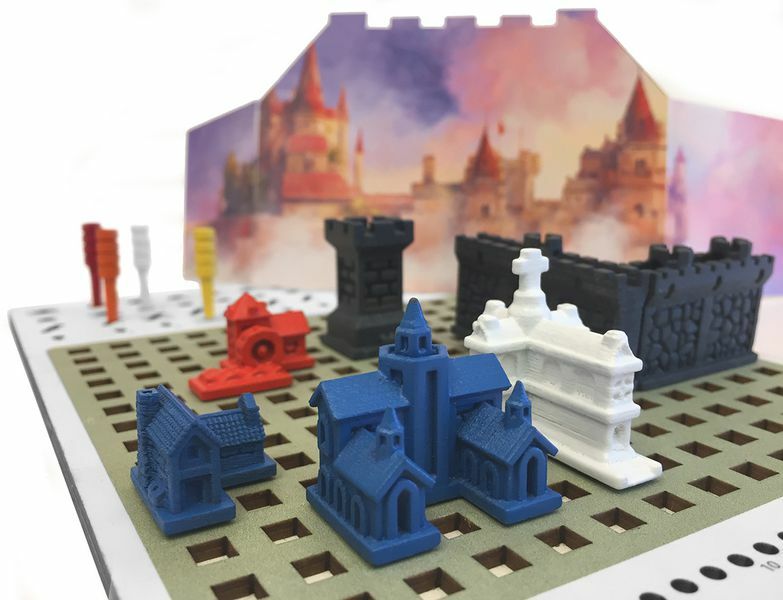 The principle is the same, but instead of marks on a score pad you get to place fancy looking miniature buildings on a board. Players will have fun ways to interact, too. Extortion, diseases, that sort of thing. You know, friendly interaction. The board of Aftershock looks like a Ticket to Ride style game in an extremely small area, with routes of varying length connecting different cities. However, this game is less friendly than train building. The routes on the map show bridges connecting the cities of the Bay Area, only they are all gone after an earthquake. The players job isn’t simply to rebuild those bridges. Those are just a means to an end. The real goal is to have the most meeple in a city when it scores. Different kinds of cards allow you to place meeples, build bridges and trigger aftershocks that force meeples to move out of one city and into another across those bridges. The rules to aftershock are relatively simple, but the game is hugely interactive. You acquire cards by buying them from other players who have to sell them, you move everyone’s meeples around with your aftershocks, and even to score a city you mostly need a help from another player because only cities with at least two score markers are scored in any given round. All this happens through multiple phases of hidden planing, so you never know what your opponents will do. That’s a level of interaction many euro style games don’t have at the moment. Really makes my mouth water for this game. We don’t have many details about Hadara yet, but the new game by Benjamin Schwer (Livingstone, Crown of Emara,..) and Hans im Glück looks to be a medium-heavy gamer’s game. Each player leads an ascending civilization through three eras of their history, take care of finances, feed the population, conquer colonies, and especially hire specialists to make your empire flourish. Nothing about game mechanisms yet, but we’ll leet you know as soon as we learn something. You know Munchkin, the hilarious dungeon crawling card game to lose friends over. Didn’t you always think it lacked miniatures? CMON to the rescue! Munchkin Dungeon puts the monster killing and friend stabbing on a board, with CMON quality minis to boot. The rules will obviously be different from good, old Munchkin. One change I like a lot is that your opponents can only unleash bad things on you if you have collected enough thread tokens, and how many of those you get depends on how quickly you move through the dungeon. That should curb the complete and utter randomness that is Munchkin a little without taking all the fun out. I already love Splotter Spellen’s Food Chain Magnate for a heavier game, but with the coming expansion they really want to make sure I play it more. The Ketchup Mechanism and Other Ideas has an awesome name, ketchup, new employees, milestones, foods and buildings. Most importantly, however, it has baristas and coffee places for hungry customers to stop at for a quick dose of caffeine while on the way to your restaurant. There was already a lot to take into account when building your food franchise empire, but this expansion will add whole new layers of strategy.